Interesting article from the NYTimes, “Why Bricks and Clicks Don’t Always Mix” . This article illustrates how Netflix is competing with Blockbuster in the video rental business with a cost and operational advantage. 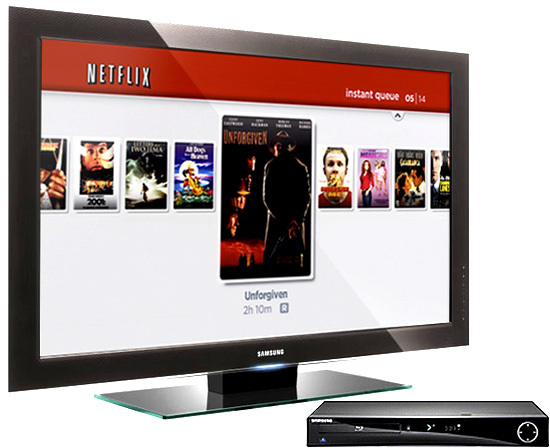 With Netflix moving toward streaming movies over the Internet, they are aiming to reduce their costs even further. Will Blockbuster be able to keep up? Blockbuster shouldn't have too much difficulty cutting costs by moving down the learning curve of online distribution through a focused effort, just as Netflix was able to do with home delivery. However, if it moves towards streaming, Blockbuster will have to find a competitive advantage to sustain itself. Given Netflix' operational prowess, it seems that the best place to compete might be on the fixed costs side (i.e., licensing deals with movie studios). With a much longer history of movie distribution, Blockbuster may be able to leverage its studio relationships to get the best deals and keep itself afloat. I think this case really shows how being a first mover in these kinds of markets can be a huge advantage. I agree with Evan that Netflix is winning the battle right now by being further down the learning curve than Blockbuster. Although, it seems to me that the battle, while not over, is not as close between the two. The momentum that Netflix has gained over Blockbuster has already shut down many of Blockbuster's physical stores, and I believe that in the time it takes Blockbuster to recover from a drastic change of distribution strategy, Netflix can easily negotiate similar deals with studios as the "new hot shot" on the block. Not directly related do this story, but here's a read about the new Intel Chip Pricing Upgrade scheme we touched on briefly in class. I agree with Evan's comment above. Blockbuster needs to find a competitive advantage, and one way to do that is to satisfy customer demands. From the customer's perspective, the ability to stream new releases as soon as they come out is incredibly valuable. If Blockbuster can broker better deals with the movie studios to have the latest releases out before Netflix, Blockbuster should attract more customers and steal business. However, if Blockbuster doesn't have the customer base then movie studios may be less likely to broker deals. It's a chicken-and-egg conundrum. I think this is certainly an interesting case and one that clearly shows the power of the power of the internet now that bandwidth is overly abundant and extremely cheap. I'm pretty sure this story still ends very very badly for Blockbuster. Netflix has a huge headstart in enabling content distribution through every possible device: Xbox 360, DVD Players, and as of last night I have an app on my iPhone that lets me stream Netflix content (hopefully no one notices me watching Ace Venture behind my nametag in class today). Netflix's device proliferation is going to make switching costs to whatever Blockbuster offers extremely high! It's also interesting to think about whats going to happen to traditional cable companies. With over the top boxes (i.e. internet enabled video streaming hardware like Boxee, Apple TV, and Google TV) coming onto the scene to challenge cable offerings, we are (hopefully) going to see a trend towards debundling so that cable as we know it can stay competitive. HBO is going to realize really quickly that I pay $14.99/mth ONLY for Entourage, and don't care at all about 6 Feet Under. And lastly - looks like as of today Blockbuster is officially in Chapter 11. While this is a move simply to restructure around the streaming and kiosk business, its a final reminder of how severely they were disrupted by Netflix. The NY Times Dealbook has an interesting article on how Blockbuster may try to compete with Netflix moving forward. The article puts a lot of weight on the different terms that Blockbuster gets from studios, enabling it to release titles sooner, albeit at a higher cost (which will be passed on to the end-customer price). Result of this competition seems to surface already. News this morning: Blockbuster files for bankruptcy protection, from MSNbc. 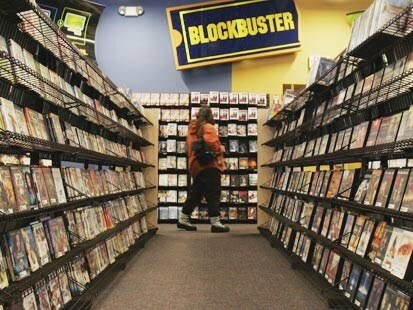 "Troubled video-rental chain Blockbuster Inc. filed for bankruptcy protection and said it plans to keep stores and kiosks open as it reorganizes. The move, long expected and pre-arranged with bondholders, effectively ends an era that Blockbuster dominated — of Americans visiting video-store chains for the latest movie-rental releases. Increasingly, Americans are watching movies via video subscription services like Netflix Inc., video on demand and vending machine services such as Redbox." Who will be the next winner to beat Netflix down? Let's also not forget Redbox! It may just prove that there still is a market for physical DVD rentals, but the business model has changed (tied to supermarkets and convenience stores, carrying limited but new inventory). With all these avenues available to consumers, Blockbuster just found itself stuck in its old ways while the customer base became more sophisticated and had moved on. You know that Nintendo Wii, Microsoft Xbox 360 and Sony PS3 support Netflix Watch Instantly. In addition, Roku’s setupbox, Seagage media player, Western Digital media player, most of blu-Ray players, Apple TV, Internet TV, Tivo DVR is also supporting Nexfliz Watch instantly. I think this game is already over. Netflix become more popular due to network effect. Most of companies which have both offline and online business at the same can be difficult to be more effective than only online company because they frequently conflict to each other and usually an offline expert have the initiative to lead both companies. I think that online business itself has the success formula online that if you want to succeed in online busines, don't mix it with offline business. Agree with Joy on the Redbox comment. Netflix is not the only competitor Blockbuster should be worried about/trying to copy. There are several advantages that Redbox has over Blockbuster AND Netflix. First and foremost the rentals are cheaper (about $1/day), which is a great form of price discrimination when you think about it. Those that aren't willing to spend more than $1 on the rental can return the DVD the next day. Those that can afford to spend a few bucks can wait a few days before having to return it. With Blockbuster you have no option to make your rental cheaper. You have to pay a single (high) price, which has turned many people away, myself included, in times where spending wisely matters a lot. The next advantage is the level of immediate gratification that Redbox has over Netflix. With Redbox, you can get a dvd whenever you want, whereas with Netflix you have to wait for it to come in the mail, not to mention that its sometimes a dvd Russian roulette since Netflix will send which ever dvd on your list becomes available first. Sadly, as we see TV 2.0 taking off and content becoming more readily available online, the Redbox model, though better than Blockbuster's, will certainly need a makeover or risk being bowled over by the changing winds of time.